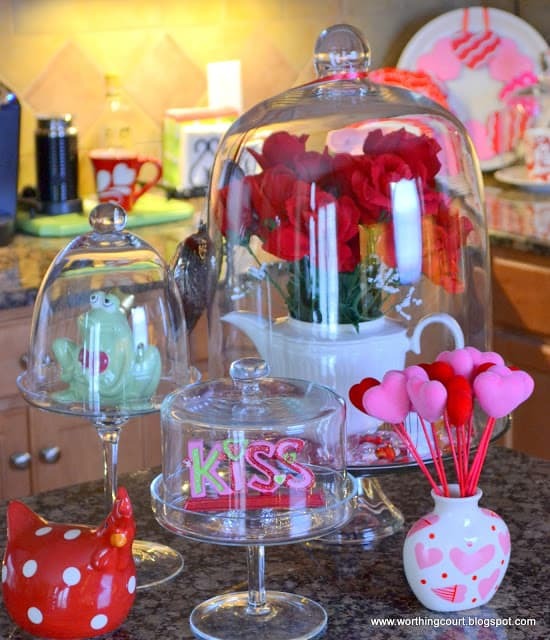 Enjoy this Valentine’s Day decor in the foyer of our previous home. We’re currently remodeling a new-to-us home. Click HERE to see how I’m totally changing my decorating style! Here’s a quick, last minute craft for Valentine’s Day. I can’t claim credit for it. 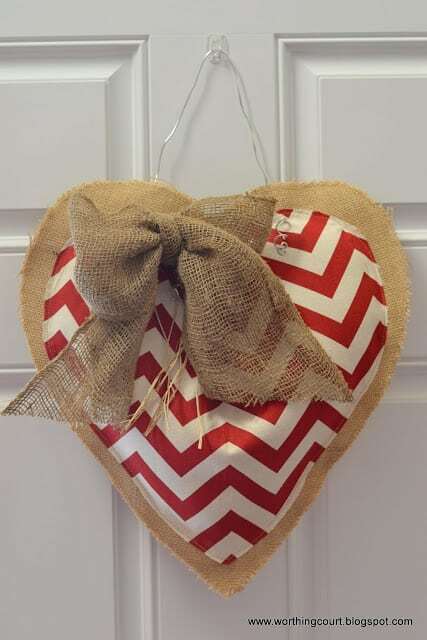 My friend Nancy was inspired by a burlap and chevron heart that she found in a shop and was inspired to make one for herself. I kind of went gah-gah over hers and had to have one too! This was sooo easy to make. It all came together in about an hour – maybe less. 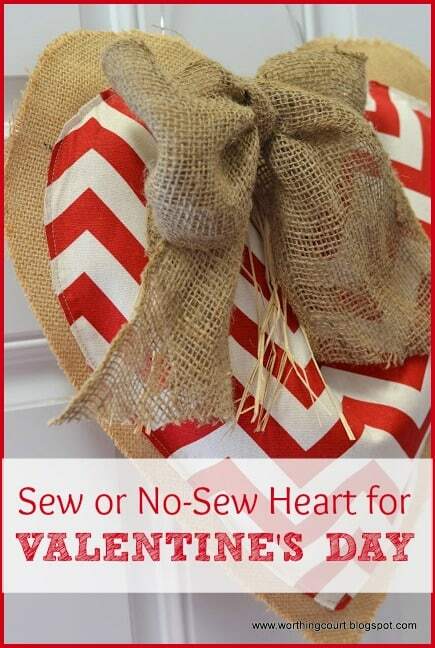 Cut two heart shapes (one for the front and one for the back of the heart) out of burlap. Cut a slightly smaller one out of a different fabric. Center the smaller heart on one of the burlap hearts and stitch, fuse or glue it down. 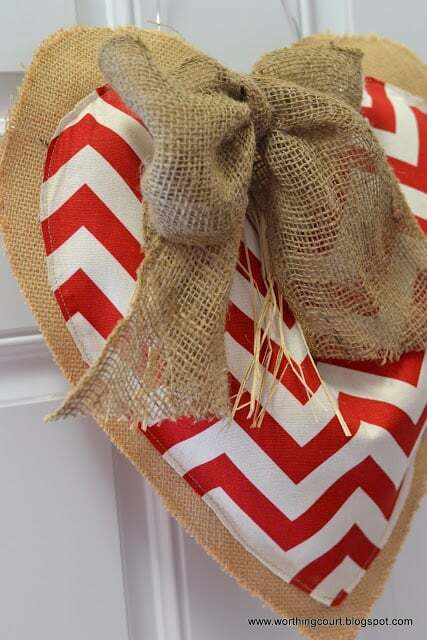 Sew, fuse or glue the two burlap hearts together, leaving at opening to add stuffing. Stuff with pillow stuffing and close opening. “Punch” a hole on either side, near the top, to feed the wire through. I used the point of my scissors to create the hole. Feed the wire (or you could use twine) through the holes. Tie a ribbon around one side of the wire. I used burlap ribbon, but you could use any ribbon. Add a bit of raffia tied around the wire too for added interest. The red chevron fabric came from Hobby Lobby. And I’ve discovered that I really like having something hanging on the inside of my front door. 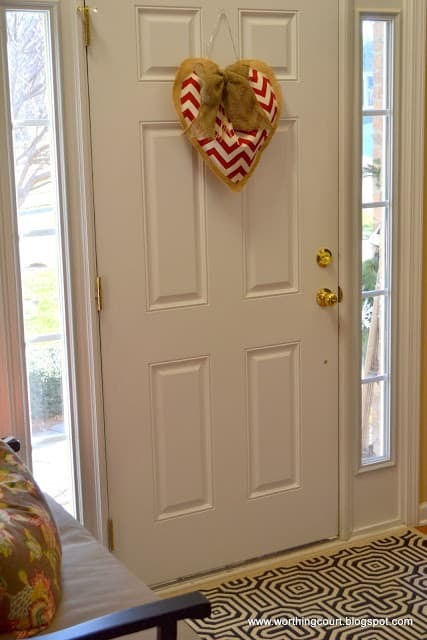 Find out to make an easy door wreath with feather boas and other touches HERE. And a Valentine’s vignette HERE. I think it is so cute. It look like you spent much more time creating this. 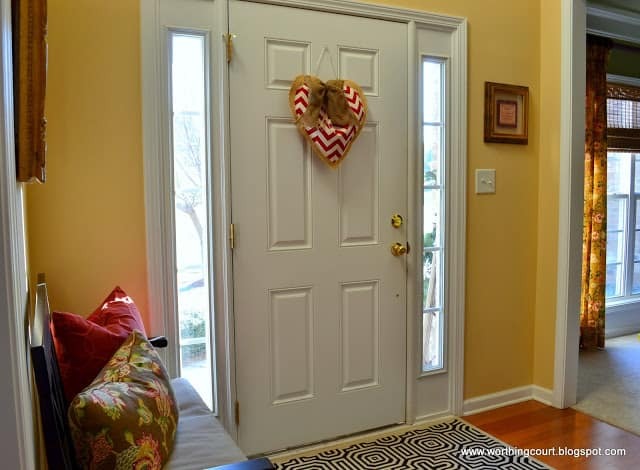 Hey Suzy…love, love the wreath….glad that you found inspiration from Nancy…looks great on your door! Cute idea! What a great idea to hang it on the inside of your door! I like the wreath very much – looks great on the door. I love it, SUZY!! 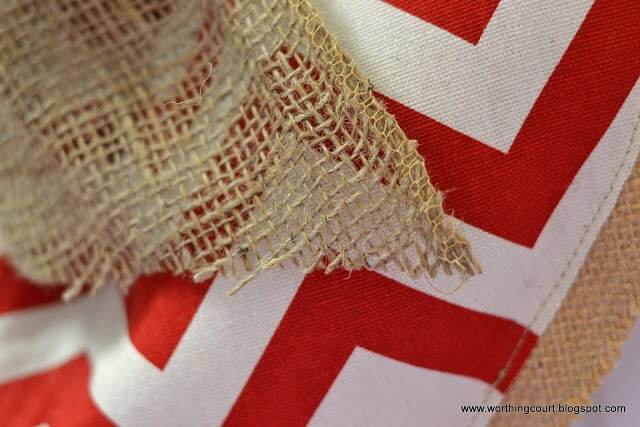 Such a fun fabric … looks great paired with the burlap! One of these days, I’m going to break out my Martha Stewart sewing machine and get to know it! 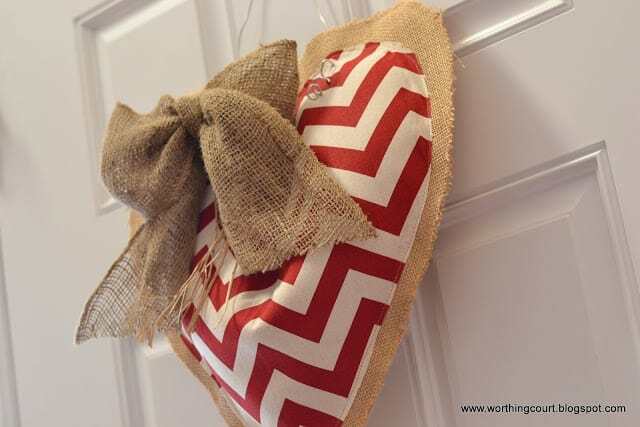 What a pretty little wreath ~ I love the way you combined the burlap and the chevron fabric. Very nice! Love the combo! Pinned to my Valentine’s Day board. I hope you will stop by and enter my 3rd Blog Anniversary Giveaway…..
Oh I just love that! It really is just so cute. Burlap adds such a nice touch to any project. Thank you so much for sharing! This is so cute. 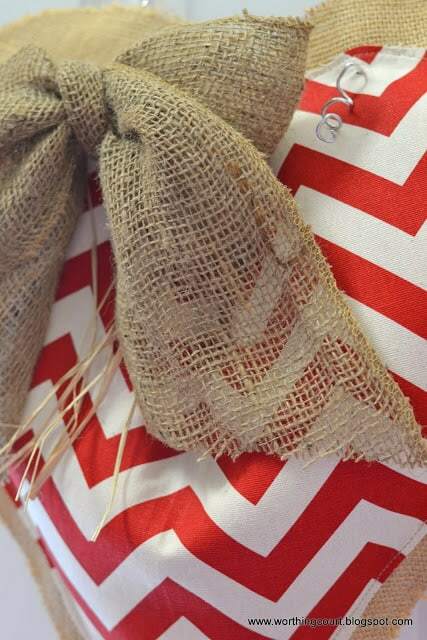 Love the sassy chevron design… and the burlap bow! Super cute! Ya can’t go wrong with those 2 items!